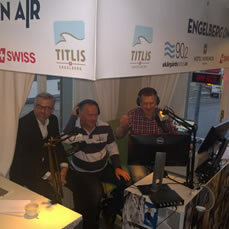 Station Manager Martin Loogna explains the Alpine experience: “We decided to move all our broadcasts for two weeks from our studio in Stockholm to a small Alp village called Engelberg in Switzerland. Many of our Swedish listeners go there for their skiing in the wintertime and we wanted to be there. During this period we broadcast all of our programs from a hotel reception area talking to people and interviewing guests. By using our RCS Zetta playout system, we only brought one of our desktop computers and a small portable studio and connected it to an ordinary 10 Mb internet line. With Zetta we didn’t need a board operator in our home studio and saved a lot of money and time. All our events and soundbits from Sweden came up automatically in the logs including news, weather and traffic.